I reached out to Erika Lynch , who is the head of workforce development institute over at Gateway Community college and we spoke about their CNC program. They are consolidating their campus into the new location in New Haven but expect to be ready by the 1st of August. She said that she would be happy to do a site tour and for us to have a look at their CNC machine. She also is intrigued by what Makehaven has to offer and is going to come by on a tuesday night once they have moved to the new campus. 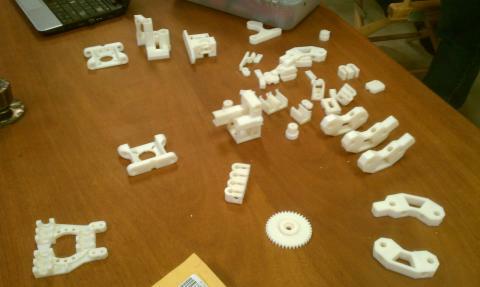 Ever since joining makehaven I've become obsesseed with additive manufacturing and 5 axis CNC. While using the RepRap and using all of the software associated with it has been a blast, the chance to get access to a 5 axis machine is really limited. So I began my quest for CNC. With a little help from the internets I taught my self the basics of Grasshopper (Rhino plugin) this weekend for the purpose of analyzing a complex tower geometry. In the course of my research I came across this posting, illustrating a way to flex file parameters with ultrasonic sensors hooked up to arduino boards. Kind of cool. Thought you guys would be interested. So I attended last night's get together and learned what a stepper motor is and helped Kam fix one that was jammed (good clean fun), but the highlight of the evening for my own personal self was when Ian Applegate showed up riding a bright green vintage Schwinn Sprint wearing an Evel Kneivel motorcycle helmet AND, under the helmet, Dominique Pinon wrap around shades (VR glasses) that were electronically broadcasting to his eyeballs what his handheld camera (in his hand at that very moment) was seeing. Some members asked me to put together a quick getting started guide for 8-bit Atmel AVR microcontrollers. Here it is. This is a picture of MakeHaven before we moved anything in. Its like a blank canvas. The possibilities are endless. What the makerspace actually looks like will depend on what equipment we get and what the membership decides is the best way to organize. To get the conversation going I decided to draw some diagrams detailing my vision of how we could organize. The basic concept that I have is based on several areas that have all the tools organized for various purposes: these include: a kitchen, craft, mechanical, computer and mechanical areas (woodworking would be in the basement where there is more space). Most of these areas are open to the a flex area that can be used when any project requires more space or when we are conducting a workshop. Make Haven member Frank Pelliccio brought in his soldering equipment to and allowed members to try it out. We practiced by removing components from circut boards and learned about his experiences printing circuit boards and programing micro-controlers. The teaching was very useful. I had tried removing soldering before but this was the first time I had someone with so much experience there to give tips. I really enjoyed the energy of the first move in day at MakeHaven. The location is perfect and very welcoming to street traffic. I foresee the upstairs having a large open flexible area, a creative lounge and work areas for electronics, robotics, crafts, and the link. The basement is well setup for storage and some wood working equipment. To capture the first day moving into the space my friend Kam used his time lapse camera to record the action.